Humidity indicators are important for pharmaceutical laboratories, cleanrooms, and other indoor and outdoor areas where controlling humidity and temperature is essential. Select from a wide range of meters that have internal sensors or remote sensors. 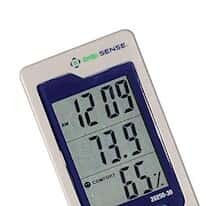 A digital humidity meter with internal sensors measures the ambient temperature and humidity levels in the area surrounding the meter. Indicators with remote sensors measure parameters away from the meter. Additional features such as alarms, dew point and wet bulb calculation, and selectable temperature units are also available.